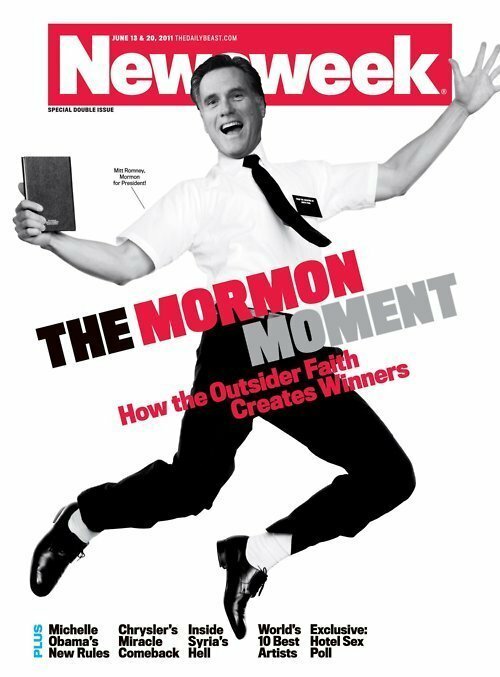 Newsweek's cover story about Mitt Romney spoofed the musical's Playbill design. On the one hand, reports were that Manhattan hotels were scrambling to contact the church and procure more copies of the Book of Mormon after guests began snatching them from hotel nightstands at a brisk pace. White shirts and name badges became a cultural icon. Really, how many of us could imagine a giant crowd of people (okay, other than BYU students), screaming “Yeeaah!” in response to a man with a bullhorn asking, “Who wants to see the Book of Mormon tonight! !” (0:20-0:30 in this video). Our winning trio’s work also seems to have reset the bar for minimally socially acceptable treatment of Mormons higher than it has been in the past. Now, if you want to mock Mormons in polite society, you have to do it with healthy helpings of affection and humor and an admission that we aren’t any crazier than any other religious people. Maybe still not quite as kind as I’d preferto be treated, but (with a perhaps somewhat tenuous reliance on correlation implying causation) I’ll note that, subsequent to the musical’s release, we saw broad mainstream media condemnation of anti-Mormon comments such as those from Robert Jeffress. On the other hand, by setting eye-popping blasphemy to an irresistibly catchy tune, the musical has ensured that this particular profanity is destined to be with us for a long, long time (I suspect the song I’m thinking of is the same song Jon Stewart was referring to when he said, “There is a song in this that I think, when the aliens come thousands of years from now, it may exist as the only memory of Earth, and I gotta say, I’m happy to go down with it.”). 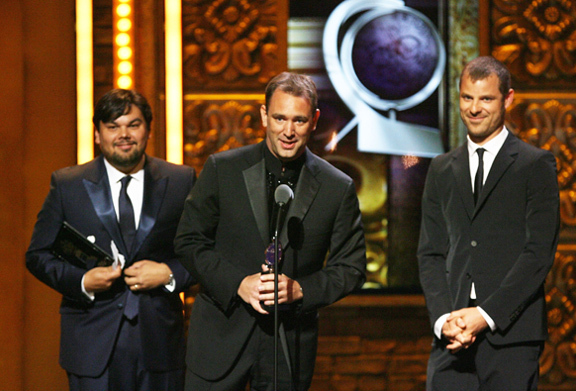 I present to you Trey Parker, Matt Stone, and Robert Lopez: your 2011 Boggses and/or Doniphans. And be sure to head over to Times and Seasons to read about the 2011 Mormon of the Year. This is the first time the award has been deserved as titled – that the winner(s) didn’t deserve just half of the name. I say more Doniphan than Boggs, although there certainly were Boggsian elements. Will anyone officially notify Trey, et al? I think they would get a kick out of this, AND include it in an episode of South Park, even…. We tweeted to the BoM Musical’s twitter account, so they might find out that they are being recognized for their attempt to exterminate and/or save us. Cynthia– I don’t think Trey or Parker (Don’t know about Lopez, but he did crack me up with his take of the Visitors Center Jesus) would want to live in a world without Mormons; ‘exterminate’ probably isn’t the best verb there. I second Ray’s Doniphan suggestion. Though the majority of ‘Boggs’ that I noticed were due to audience members and not the trio themselves. Newly, ‘exterminate’ refers to Boggs’ role in history. No doubt these were the most deserving nominees. Nice write-up too, Cynthia. Well-deserved, I think, for good or evil. h/t to Peggy Fletcher Stack for this SLTrib writeup on both Mormon of the Year and Gentile of the Year. Great choice for this years award, with the record breaking profits (not prophets) this show is generating, make sure you suggest that they tithe their increase to the churchs African relief fund as a small gesture of latter-day spoffing.